I am coming out as a spiritual seeker, after more than 20 years of intensive practices and a whole lifestyle cultivated around my desire to be one with the Divine. It is a time in the world when Peaceful Warriors like myself must stand up and own what we do and who we are. It is a time to be awake, to speak up, to stand tall in who we really are. I would love to open up 7 complementary sessions of 30 minutes for people who are interested in finding out more about your own connection to Inner Peace, and practical steps as to how you might find it in your life. Go here to book your DISCOVERY SESSION Now! (Free of charge) Or send it to a friend you know could use it. Why do I need to come out as a spiritual seeker? 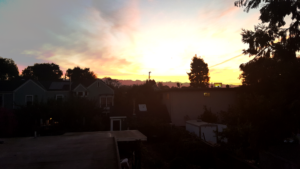 Sunrise in Berkeley from my bedroom window. A few days ago, I realized that the way I talk my business, and write about my life online is somehow cloaking this absolute fundamental truth of who I am and what I do. This realization has prompted a new way of seeing my business and my life, symbolized by the image of the sunrise from my bedroom window taken this morning. My whole life is dedicated to helping people move closer to their own spiritual truth, including myself. But I have felt uncomfortable to talk about it because of my upbringing in a spiritual desert (Perth, Western Australia) and the fact that the world is still largely materialistic in its orientation. Alongside this, there are many spiritual people out there that are promoting techniques and philosophy that does not help people to connect to themselves in a real way in my view. And I did not want to be branded alongside that. However, the time has come to stand up for the Truth and speak about my own values and training in regard to cultivating Peace. Why is Cultivating Inner Peace Important in these Hectic Times? Inner Peace becomes one of the most important things to cultivate for many people as times get more intense, and the news creeps into our own neighbourhoods with increasingly challenging situations to face. The thing on many people’s minds here in Berkeley over the last days has been fresh air. The last week was definitely challenging in many ways, knowing our neighbours and friends up in Nappa and Sonoma were in life threatening fires, and also because our own air quality was at some points worse than the most polluted cities in the world. How do we maintain any kind of inner peace when the climate around us is anything but that? And is it even important when in fact there are life threatening situations so close-by? For myself, with my journalist background, I find that I am obsessively looking up the news to find out the facts about what is happening when there is a disaster nearby. And this of course has been quite regular in recent months. There were cyclones, there was a mass shooting, and then there were fires of such shocking magnitude, that even for someone from Australia where bush fires rage every year it was difficult to stand by knowing that friends so close have been caught in the tragedy. Facts are good because they create clarity, at least we know what we are dealing with. However, when watching the news becomes more obsessive, and my headspace more on the side of panic and pain, it is not helpful to anyone. When I went inside of myself and really found a grounded place, and then sat with a friend who held space for me, I realized I was tapping into the wound of all the people without homes and even those suffering losses of loved ones. There was also a hype for the fire fighters and rescue workers who have been doing such an incredible job. But again, feeling the pain of the situation and getting pulled down into my own heavy relationship to grief did not help anyone, least of all me. How Can We Get Back to Peace When We Have Lost Our Way In The Noise? My friend holding space for me beckoned me back to the high soft wings of Peace. The knowing that all of us as human beings have deep inside that we belong to Peace. This our home. When we get quiet and still enough inside, there is a knowing that our spiritual home is always right there at the core of each human’s being. To belong to Peace is indeed precious and sweet. It is always there, even in the greatest challenge or tragedy. The block to our birth right, access to Inner Peace, is our mind. The emotions and thoughts that go round and round with ever increasing noise and nurosis block access to the great relief offered at the core of our Being. Peace exists inside of us where it is silent. It is there beyond the ordinary mind, calling in such a quiet sweet tone to our hearts. All of us feel this gentle longing at times, yet when things outside of us get so loud we forget. Do We Need to Withdraw from the World to Find Inner Peace? There is a common misconception that we need to withdraw from the world in order to feel Peace. Well it is true that withdrawing from the world is necessary at times and does give you more chance of connecting with Peace. However, when withdrawing from the world means hiding from reality, it does not bring Peace. Remember too that Peace comes when we do the right thing. So if you do need to take care of loved ones or there are important preparations to make for emergencies, this has to be done alongside the knowing of inner Peace. Peace does not take away the need to meet the demands of life, but it does make the doing of these things entirely different. When we step up to meet life just as it is, with a knowing of Peace deep in our hearts, it is somehow lighter. The heart can still sing the song of yearning to return to it’s own source, while we are here in this challenging and busy world. The two do not have to be mutually exclusive. How Can Peace and The Busy Reality of Modern Life Co-Exist? I am going to say that in these times it is even more important that Peace and the reality of our challenging world should not be kept separate. Peace and the busy life around us can co-exist. When this co-existence happens, we have a really different impact on those around us. It is hard to even quantify this. All I can say is that people feel it, and it does create ripples in a good way. Sometimes even cultivates the possibility of a Grace. Mythology, fairy tales, cultural stories from different part of the world tell us about this power of the Peaceful warrior. The stories of the Bodhisattva for example. Bodhisattva (in Mahayana Buddhism) is a person who is able to reach nirvana but delays doing so out of compassion in order to save suffering beings. These people work in the world to help fellow human beings rather than leaving it all behind for one-ness and exiting the cycle of reincarnation. Or the ancient tale of The Mahābhārata, the longest poem ever written which includes The Bhagavad-Gita where Arjuna is counseled by Lord Krishna to fulfill his duty as a warrior. This epic tale takes place on a battlefield and not in a hermitage. Samuel Sagan in the Knowledge Track, Death the Great Journey touches on this topic in a different way when explaining the complicated concept of Karma. I will not go into lots of details about the concept of karma except to say it is not what you think. So go there to read more. “Let’s insist on this point: if the motivation of sages such as Arjuna or Sri Aurobindo had been to accumulate good karma instead of following their spiritual intuition, the world would be turned into abysmal chaos. This is where intrinsic contradictions are revealed in the position of karmic fundamentalists. Refraining from killing is good karma. But how could it be good karma to let the world sink into chaos? What if for example in 1939 the English had taken the attitude: “Killing is bad karma. Therefore we shall not fight against the Nazis.” What if as a result, the Third Reich had prevailed and ruled over the world for five hundred years? How is Being Connected to Inner Peace Going to Make a Real Difference In the World? I have come to the firm conclusion that connecting to the frequencies of Peace and Truth, no matter what is going on around me, is really the greatest giving I can make in this life. Whether I am seeing clients and inspiring them to see the light of their own Being and step into who they really are, or running a meditation class in Berkeley, or just in a conversation with someone on a date, I feel that Being in myself on this level of inner calm does create positive outcomes for those around me. This kind of positive shift that comes from one person choosing to be themselves on a level beyond the mind no matter what, and to connect to the very core of their being in all circumstances, is immeasurable. For me though, there really is no other choice. In celebration of the choice, I would love to open up 7 complementary sessions of 30 minutes for people who are interested in finding out more about your own connection to Inner Peace, and practical steps as to how you might find it in your life. In future articles on this topic I will explain in a real and clear way how and why this is so. Yearning for Silence and Stillness in This Hectic Life? Winter Solstice and Receiving – a time for gratitude and letting go…..
Hannah Sone on Yearning for Silence and Stillness in This Hectic Life? Jeanette on Yearning for Silence and Stillness in This Hectic Life? Jeanette on Developing Your Self-Care Plan – Part 2. Rhythms and cycles. Discover More About Personal Transformation, Meditation and Matters of the heart. Vulnerability is Your Greatest Strength. * We will never give your email address to anyone else for any reason. Discover more about Meditation Skills for Self Empowerment. This session will help you to find out more about where you are now, where you really want to be, and what is in the way of making this happen for you.